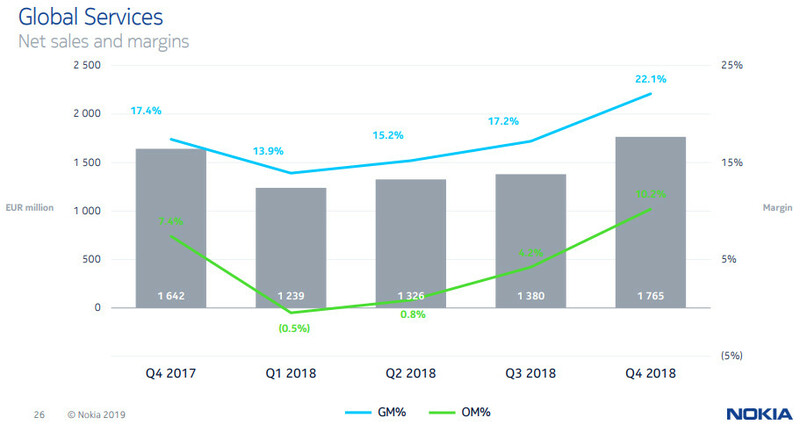 Nokia matched that revenue growth with a 3% increase in net profit too, and the solid quarter helped it to grow revenues by 1% for the full year after adjusting for adjustments. 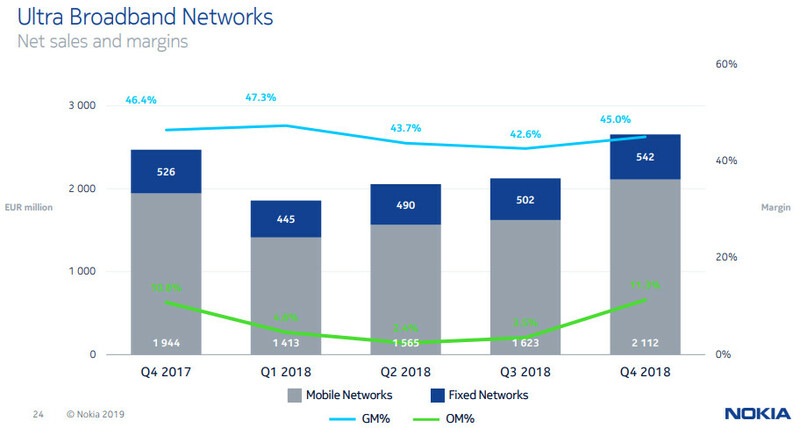 As ever the networks business was the driver, with its 6% revenue growth offsetting declines in the other reporting segments. On that note Nokia is going to start reporting its software business separately from next quarter. On the negative side Nokia doesn’t sound too bullish about the state of the market this year. “Based on the evolving readiness of the 5G ecosystem and the staggered nature of 5G rollouts in lead countries, we expect full year 2019 to follow a similar pattern as full year 2018: a soft first half followed by a robust second half, with a particularly weak Q1,” said Nokia in its outlook. One of the reasons for the 5G not ramping as expected this year may be some interoperability problems that Light Reading has been sniffing around. The whole standard is still very much a work in progress with Release 16, which covers a lot of technologies and use-cases over and above enhanced mobile broadband, not expected until the end of this year. So apart from the usual US suspects not being able to resist jumping the gun in their desperation for quick marketing wins, there is little incentive for operators to go big on 5G in the short term. 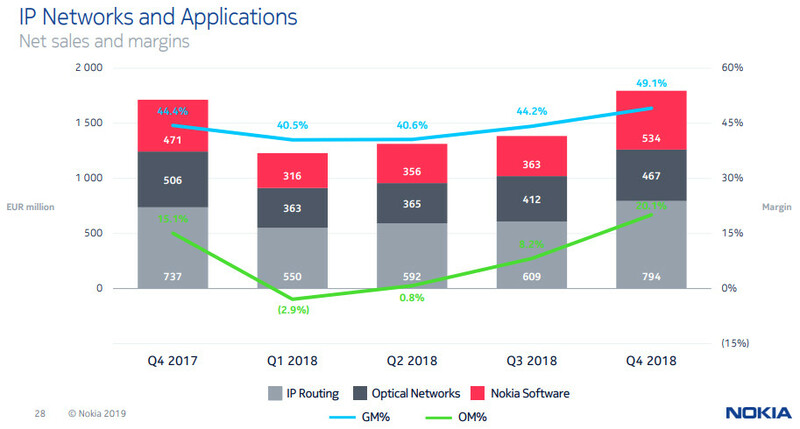 We expect a lot of the MWC talk from vendors such as Nokia to focus on getting ahead of the game, 5G readiness, etc, but it looks like the industry is opting to keep its powder dry for now. 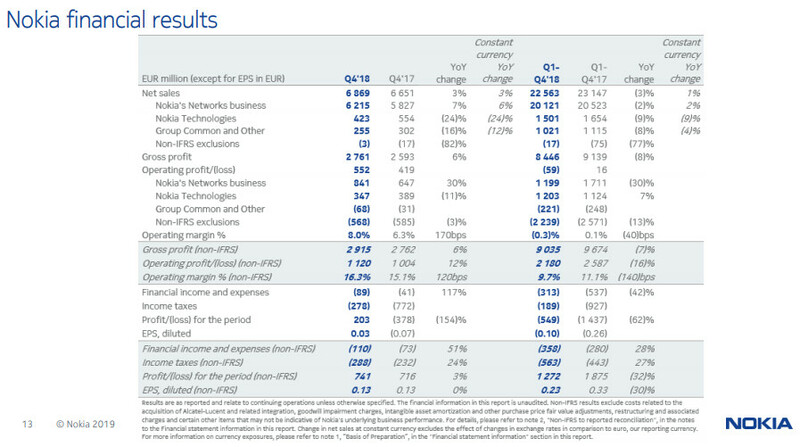 Here are some Nokia slides, which clearly illustrate the pattern of a slow start building up to a strong Q4 that the company expects to repeat itself this year. Nokia’s shares were down a couple of percent at time of writing.